We understand that finding an Investigator may be a sensitive undertaking and presents unique personal challenges. We respect your privacy and we offer 100% discrete and professional service. Please give us a call or submit a confidential email using the form below and we will get right back to you. James G. Murphy, Chief Executive Officer and President, founded Murphy’s Detective Agency in 2000 following 5 years of service as a Private Investigator for another agency. In 1995 he retired from law enforcement with 33 years of service during which time he served as an elected Sheriff for 18 years. He is a past president of the National Sheriff’s Association and is the Past President of the Vermont Association of Investigative & Security Services. He holds degrees from the University of Southern California, FBI Academy, Babson College, Champlain College and the Vermont Police Academy along with numerous awards and commendations for his outstanding work in the Criminal Justice and investigative fields. Jim supports and is the proud member of many outstanding local organizations including the Masonic Order of Masons, Shriners, Elks Club, Scottish Rite, York Rite, Vermont Referees Association, Vermont Umpires Association, Vermont Basketball Association, and the National Sheriff’s Association. Some of our investigators are former law enforcement officers, which allows us to offer a great background and foundation for our clients. All of our investigators must complete extensive training in every area that we offer prior to being able to perform investigations. We seek out only the most qualified and highly respected individuals to become investigators. Our investigations typically produce great results and thats due to our extensive training. Our company belongs to several organizations including Vermont Association of Investigative and Security Services (VAISS), National Association of Investigative Services (NAIS), New Hampshire League of Investigators (NHLI), South Carolina Association of Legal Investigators (SCALI), and International Investigators. In 2007 after major expansion to our company, we changed the name of the business from Murphy’s Detective Agency to ADA Bureau of Investigation. Our company employs all the latest technology when conducting surveillance for any type of case. From high tech video cameras, pristine digital still photographs, to covert camera operations, we get you results!! We continue to train our investigators regularly on all the latest techniques to obtain the best results for our clients, whether its for a domestic type case or a workers compensation fraud case. We use several types of vehicles, disguises, and methods to get the job done right the first time. How do I contact an investigator? No, not initially. We can simply discuss your case and answer any of your questions before you retain us. Once we become more involved and you do retain us, then yes, we will have to get all your information. Even after you retain us, no one will know that you were in touch with us unless the case goes to court or you tell them. All of our cases are 100% confidential. Its very difficult to say how much it will cost, due to the fact that we offer so many different services. Services can range from under a hundred dollars to thousands of dollars, depending on the complexity and the length of the case that you may have. When you call us, we can give you an estimate. What is the process after I decide to hire you to conduct an investigation? Once you decide that you want to hire our agency, we will meet with you and have you sign our contract to have the case get started. The contract is signed on any case that we take on and it protects our company from theft of services and misuse of information obtained. Once the contract is signed and we have secured a retainer, we will begin the investigation. During the case, we will give you periodic updates as deemed necessary. When the case is finalized, you will receive all evidence, a professional DVD (if the case is for some type of video surveillance) and a financial statement explaining where your money was used. Every case is different, but this is the way it typically works. I think my husband/wife is cheating on me, what should I do? Call us. We will go over your concerns and options and try our best to find an answer to your questions. Whats the guarantee that your going to get results after I hire you? We have been in this business long enough to know that there are never any guarantees that we are going to get full results. Your results are 100% effected by who we are watching or even the type of case we are doing. For example; if we are hired to conduct surveillance on subject John Doe, and subject Doe never leaves his residence while we are on surveillance, we cannot obtain any results. Another example; if we are hired to locate subject Doe, sometimes people live “underground” and don’t want to be found. It may take us days, months, or even years to find subject Doe. Do I need an attorney before I hire you? Not always! Depending on the type of case, many times its not necessary to hire an attorney prior to hiring our agency. During our initial conversation we will discuss with you whether or not we will take your case without you first hiring an attorney. In Vermont all Private Investigators must hold a valid Private Investigators License issued by the Vermont Secretary of State. A license can be obtained in two ways. Applicant must of served as a police officer in Vermont for two years, or second, have worked for licensed Private Investigation Agency in Vermont for two years. If you feel you have the qualifications and you do not have a police background you should call Private Investigations Agencies here in Vermont to seek a job as a PI. You may visit the Vermont Association of Investigative and Security Services web site for Investigation Agencies which will list their phone numbers. . 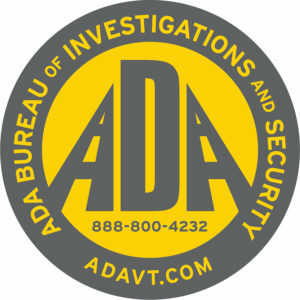 If you would like more information about ADA Investigations please call us at 888-800-4232. You can also send a confidential email using the form below and we will get right back to you.